“What are we doing today?” is my daughter's favorite question on Saturday mornings. If you and your kids are looking for a little adventure without breaking the bank or traveling too far from home, then you must check out fun day trip destinations or staycations! When you have young kids, staycations or day outings at family friendly destinations are perfect during spring break, summer break, or any time of year. A full vacation can be expensive and the most popular vacation spots will be busy. We don't usually plan a vacation during my daughter's spring break from school, but we do like to plan a few special activities. So, I thought I'd share some of the places we like to go as well as places we'd like to check out that are within driving distance from the Milwaukee area. 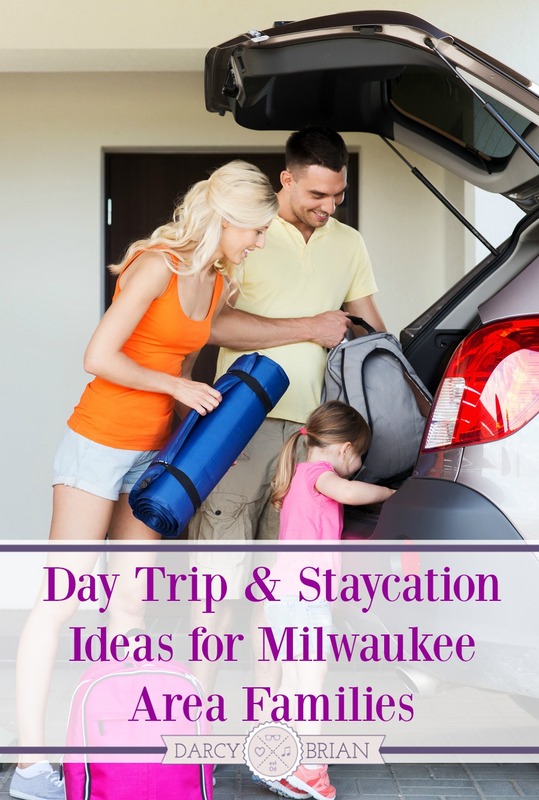 Whether you live in and around Milwaukee, or if you are planning to visit the area, you won't want to miss checking out the Milwaukee Art Museum or the Milwaukee Public Museum. The art museum frequently has activities to engage your child's artistic side. The Milwaukee Public Museum offers plenty of exhibits to explore or you could watch a movie in the IMAX theater or check out the planetarium (depending on how well your little ones can sit still). Let the kids get hands on with learning at the Betty Brinn Children's Museum or at Discovery World. It'll give you and your kids a break from having to keep their hands to themselves. At both places they are encouraged to interact with exhibits to help them learn. Depending on the weather, you may also enjoy strolling around the Milwaukee County Zoo. If you're needing a taste of summer and want to go swimming, you'll want to head over to Country Springs Hotel Water Park & Conference Center. You can stay in their hotel for a mini-getaway and have waves of fun in their indoor water park. You can read about our stay at Country Springs when my daughter was just a toddler. Do you have a little adventurer in your family? Head out to Cave of the Mounds and go exploring! Enjoy the park, tour the cave, and find treasure. I remember visiting this natural landmark a few times as a kid and have gone once as an adult. We need to plan a trip there with the kids! While you are over there, you'll also want to drive to Spring Green to visit The House on the Rock. I remember being completely fascinated by the eclectic collections you can look at throughout the self-guided tour, such as the world's largest carousel. It is an amazing building, even if I find it a little scary to walk out on the glass walkway. They also have a nearby inn with a pool. If you're over by Madison, you have to stop by Ella's Deli & Ice Cream Parlor for lunch and a treat! It's another place with a fun collection that kids love to check out. The carousel usually starts running in the spring, so hopefully the kids can take a ride while on spring break. Madison is also home to the Henry Vilas Zoo, one of the few zoos without an admission. While you are in the area, it is worth a visit! The weather in Wisconsin during spring break is always iffy, which makes family travel to an indoor water park perfect. Breaker Bay at Blue Harbor Resort in Sheboygan looks like loads of fun. They also have an indoor mini glow golf course and other fun amenities for the whole family. Plan a day or two in the city so you can explore the Shedd Aquarium, The Museum of Science and Industry, and The Field Museum. These are some of my favorite places to visit in Chicago. The kids won't even realize they are learning, they'll be having too much fun investigating! Need more to do? Amaze the kids with a trip to LEGO Land Discovery Center! I don't think I even need to explain why that is a great idea. Maybe you want to head in the opposite direction and check out Cedar Point's Castaway Bay, a Caribbean themed indoor water park resort. They have activities for all ages, including a children's crafts and activity area. What is your favorite family friendly spring break or summer destination? Don't miss our Family-Friendly Milwaukee Area Bucket List for Summer!